Robert Honstein and Maria Finkelmeier run the Times Two concert series. 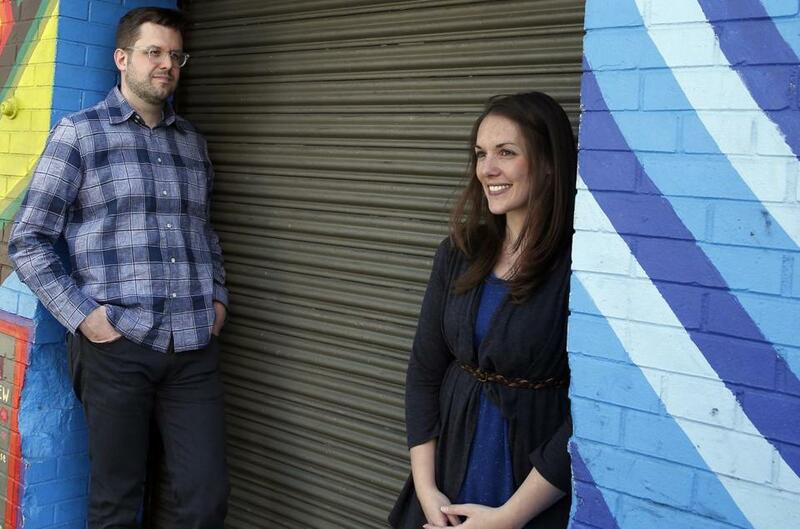 The percussionist Maria Finkelmeier and the composer Robert Honstein are easily two of the more plugged-in operatives currently at work in Boston’s new-music scene. Finkelmeier, a one-woman dynamo, is the program manager of the Entrepreneurial Musicianship Department at the New England Conservatory. Outside of her day job, she plays concerts regularly, conducts workshops, and organizes such oversize public events as Make Music Boston (which returns on June 21) and the performance of John Luther Adams’s “Inuksuit” that will open the rejuvenated Outside the Box festival on Boston Common (July 14). Honstein, meanwhile, keeps busy with Sleeping Giant, the renowned composers’ collaborative he founded with five Yale University classmates, which recently premiered a new completion of Mozart’s unfinished Requiem with the Albany Symphony Orchestra. His works pop up regularly in Boston concerts, and he presently serves as composer-in-residence with local early-plus-contemporary music ensemble Antico Moderno. But Finkelmeier and Honstein weren’t always consummate insiders. Newly arrived from New York just a few years ago, the two connected through mutual friends, and they found common cause in fomenting the kind of musical camaraderie they had recently left behind. Earlier this year, after long months of planning, came the most tangible result of their connection: Times Two, a new grass-roots concert series at the Record Company, a nonprofit, community-oriented studio in a gritty neighborhood near the South Bay shopping center in Boston. Each concert pairs up artists who represent disparate locations and styles. With two successful events under their belts, Finkelmeier and Honstein double down on Saturday, presenting Jason Treuting of So Percussion, jazz drummer Aaron Staebell, bassist-vocalist Lisa Dowling, and flutist Mike Avitabile to end their first season. Granted, that’s not so hard to do when your audience numbers 50 members or less, but for the Times Two founders, the quality of each experience has outweighed the quantity of attendees, which they expect to grow gradually as word spreads. It didn’t hurt to have Julie Burros, the chief of arts and culture for the City of Boston, enthusiastically reporting her response to their May concert on Twitter, even tweeting a photo of Honstein’s newborn son in his protective earphones. Her presence was important, Honstein says, because it indicates that “culture matters from the ground up. You have the ICA, you have the BSO, but then you have little series like us. And it all matters, because it’s an ecosystem.” In New York, he explains, he and Finkelmeier watched as fellow artists built venues such as Le Poisson Rouge and National Sawdust, which play increasingly vital roles in that city’s musical life. At: The Record Company, 960 Massachusetts Ave., Saturday at 7 p.m.